Chris Mason is a nationally recognized mobilizer of the lesbian, gay, bisexual, and transgender (LGBT) Civil Rights Movement. He is an experienced activist and a dedicated organizer with a fierce passion for social justice. Chris and his three siblings grew up in a small town in central Massachusetts. 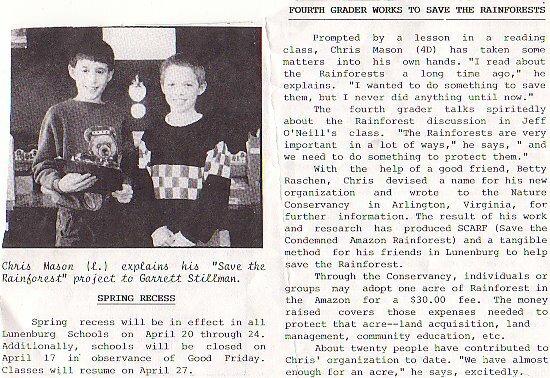 When Chris was 9 years old, he started an organization named S.C.A.R.F (Save Condemned Amazon Rain-Forest). He recruited members and together they canvassed door-to-door to raise money. With the money they raised, S.C.A.R.F. was able to buy and preserve an acre of land in the Amazon rainforest. Chris has been an openly-gay activist for half his life. In 1996, when Chris was 14 years old, he came out to his parents, friends, family, and classmates. Since that time he has been an advocate for social justice and equality. At age 15, Chris started a campaign to expel military recruiters from his high school based on the district’s non-discrimination policy. This was when he first encountered anti-gay politics and strong prejudice. Chris encouraged students and faculty to promote tolerance and acceptance in his high school. He was the president of the gay/straight alliance and worked hard to educate others at school and in the community on LGBT issues. Chris has worked on campaigns for many candidates and incumbents in the Massachusetts State Legislature. He has managed the campaigns of pro-equality candidates, all of whom ran against staunch opponents of LGBT rights. He has also worked inside the State House, serving as executive assistant to the first female Senate President of Massachusetts. canvassing operation. In 2006 Chris founded TakeMassAction, a watchdog group dedicated to tracking the radical right in Massachusetts and alerting the queer community of upcoming events, rallies, protests, hearings and meetings involving LGBT issues. Chris is featured in the documentary film, Saving Marriage, highlighting his role working to protect equal marriage rights in Massachusetts. In early 2008, Chris was elected to Ward 1 of theCambridge Democratic City Committee, and appointed as a Commissioner to the City of Cambridge GLBT Commission. During that same year he was honored to serve on the Friends of GLBT Youth Board of Directors. After the passage of proposition 8 in California, a new generation of queer activists were motivated to join the movement. Chris and four others came together to create and co-chair the grassroots, activist-led, LGBT direct-action organization, Join The Impact MA. In November of 2008 they organized the largest queer-related protest in the history of New England, drawing a crowd of over 4000 demonstrators. Later in 2009, Chris launched As Is Films, an independent film company focused on social justice and raising awareness by telling the personal stories of people who do not have a voice in today’s mass media. Chris’ first film project, Driving Equality, started with a 107-day, 22,000-mile road-trip through all of the lower 48 states to examine LGBT equality and discrimination throughout the nation. Chris described the project in an article, saying it was “incredible to meet and interview so many amazing people, queers and allies, all while living on the road out of the back of a cargo van. It was an interesting challenge to face off against a few homophobes, including the infamous Shirley Phelps from the Westboro Baptist Church. The number one lesson I learned from my trek is that real progress is being made all across the country. There is no doubt in my mind; we will have full equality and acceptance in the United States.” The over 100-hours of footage is now in post-production. The film’s tentative launch date is Summer of 2011. You can watch interviews and find out more about the project on the Driving Equality website. Currently, Chris is a student at Tufts University majoring in Sociology, with a focus in Social Inequalities and Social Change. He serves as President of the non-profit organization he founded in 2010, Progressive Approach, Inc. The organization’s aim is to create a more harmonious and just world by educating the public about progressive policy and ideals and advocating for a progressive approach toward the social issues of the day. One of the endeavors Progressive Approach has undertaken is Phelps-A-Thon.com, a website focused on channeling passions against Fred Phelps and the Westboro Baptist Church into donations for the same organizations and people that are being targeted by WBC’s hateful message. In a ceremony at Cambridge City Hall in May of 2009, Chris was honored by Mayor Denise Simmons (the nation’s first openly lesbian, African-American mayor) for his work on LGBT issues, which includes raising thousands of dollars for the Cambridge public high school’s Gay / Straight Alliance and LGBT families initiative. During the ceremony, Chris was presented with the Key to the City of Cambridge. At the 2010 “Riots to Rights – Celebrating 40 Years of Progress” Cambridge Pride Brunch, Chris was honored by Cambridge Mayor David Maher and humbled to receive the annual recognition award given to “those who have dedicated their lives to improving the GLBT community”. Chris has a fierce passion for social justice. His core issues are preserving the environment, achieving universal healthcare, protecting civil liberties, reforming immigration, combating poverty, ending war, promoting peace, and securing LGBT rights. Chris spends much of his free time traveling the country, seeking adventure wherever can find it. In his spare time he likes to be outside. Whether it be hiking, camping, canoeing, or riding at either the mountains, beach, forest, or desert; as long as he’s outside, he’s happy.